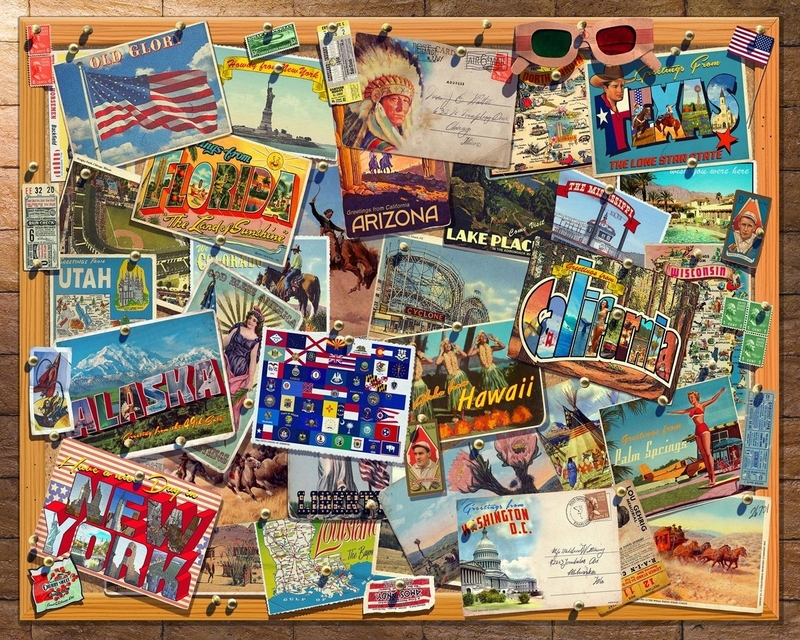 Take to the open road with "Let's Explore," Springbok Puzzles' new 1000 piece jigsaw puzzle. An intricate collage of postcards from the different 50 states is both vibrantly colorful & wonderfully nostalgic. Reviewer: Kathryn Bullington from Fort Collins, co. I am very much into art , music and mountains ,and liked the colors and arrangement of the Lets Explore puzzle. .The more color richness and depth, the better. I have become a puzzle maniac since I retired......Also, a collage puzzle with music symbols, composer icons, i.e. piano, violin, etc would have a great appeal I think. Thanks for asking for feedback! I absolutely loved assembling this puzzle! It arrived in my mailbox on Saturday morning and I had completed it by Sunday afternoon. I love the colorful old postcards and bits of memorabilia from different states. Geography, maps and travel are my favorite puzzle subjects and I would love to see even more puzzles like this one! Thank you, Springbok!